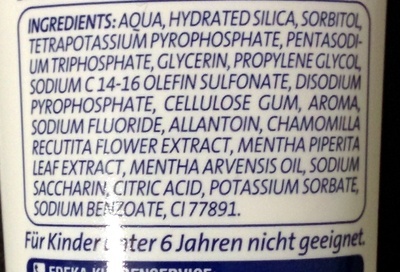 Aqua, Hydrated Silica, Sorbitol, Tetrapotassium Pyrophosphate, Pentasodium Triphosphate, Glycerin, Propylene Glycol, Sodium C14-16 Olefin Sulfonate, Disodium Pyrophosphate, Cellulose Gum, Aroma, Sodium Fluoride, Allantoin, Chamomilla Recutita Flower Extract, Mentha Piperita Leaf Extract, Mentha Arvensis Oil, Sodium Saccharin, Citric Acid, Potassium Sorbate, Sodium Benzoate, CI 77891. Product added on December 6, 2015 at 11:02:49 PM CET by hangy. Last edit of product page on November 19, 2017 at 11:48:36 AM CET by anticultist.